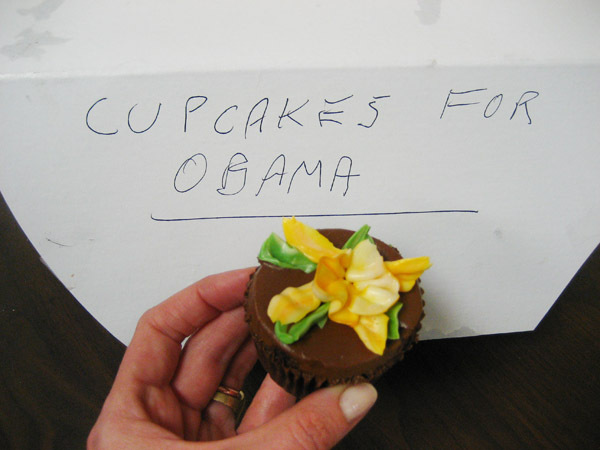 The owners of Cupcake Cafe in Manhattan are clearly Obama supporters. 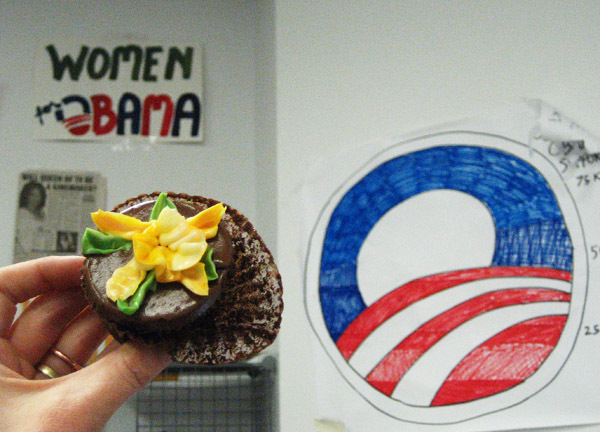 One of them strolled into the Obama Campaign office last week in Lower Manhattan carrying a huge box of cupcakes to feed the little office packed with hungry volunteers. 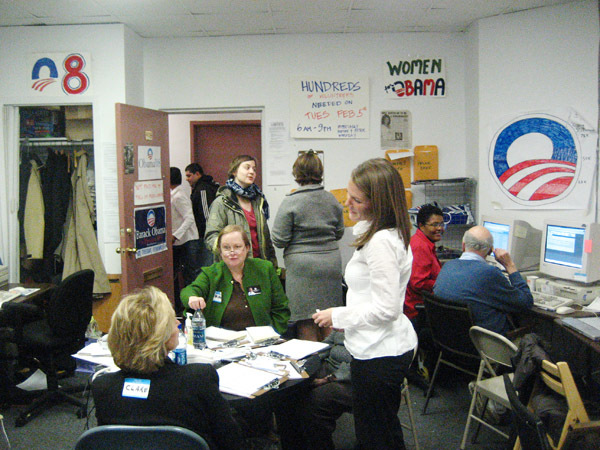 The office was bustling- so much to be done before Super Tuesday! Jack and I spent one afternoon volunteering and were pleasantly surprised by the overall feeling of the place. It was frantic, yet warm. 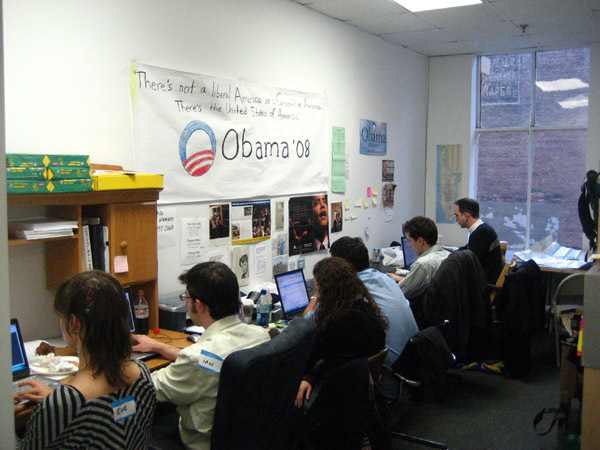 The phones were ringing nonstop with New Yorkers calling in to ask how they could help, and the staff was so full of gratitude that you couldn’t help but feel good about being there. At one point a minister from a baptist church in Harlem showed up and said he and his congregation wanted to do whatever they could to contribute. Then a dancer from Spamalot entered the organized chaos and said she had 2 hours to give until her call time that night. A man carrying a large stack of signs that read “Veterans for Obama” came in and started to pass them out. A hipster with a faux-hawk asked if he could borrow some banners for an event he was hosting in Union Square. “Of course!” they said, and loaded him up with stickers and pins to boot. I was asked to enter emails into the database. There was an older gentleman on the computer next to mine who had clearly been there all day. He really wasn’t so familiar with computers and kept asking me for help, but he was intent on doing whatever they needed. He knew how important it was to be a part of this effort. Around 5pm, he said he had to go, but that he’d be back in the morning. Everyone wished him a lovely evening and thanked him profusely. The full time volunteers were overloaded and hungry. One woman on the phone lines behind me stood up suddenly and said she was starving and hadn’t eaten anything all day. Just then a very well dressed older woman arrived carrying bags of sandwiches that she put out on the table for everyone to share. This was what she felt she could do to help and it was again greeted with profuse gratitude. I left that day, cupcake in hand, feeling fired up and ready to go. 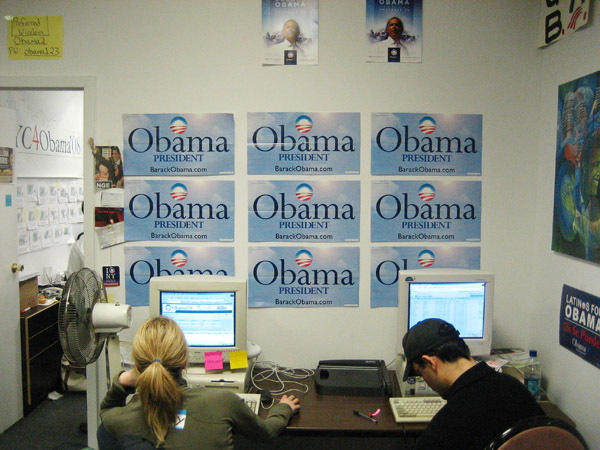 If 3 hours in Obama’s little campaign office in Lower Manhattan could make me feel so positive and hopeful, I can’t imagine what 4 years of his efforts in the White House could do. The whole world needs to feel this way and I think Obama is our best bet. I urge you all to go out and vote tomorrow. This is an amazing opportunity that I think we all need to take advantage of. If you don’t know if you’re registered call 212-VOTE-NYC. If you don’t know your polling location, click here. 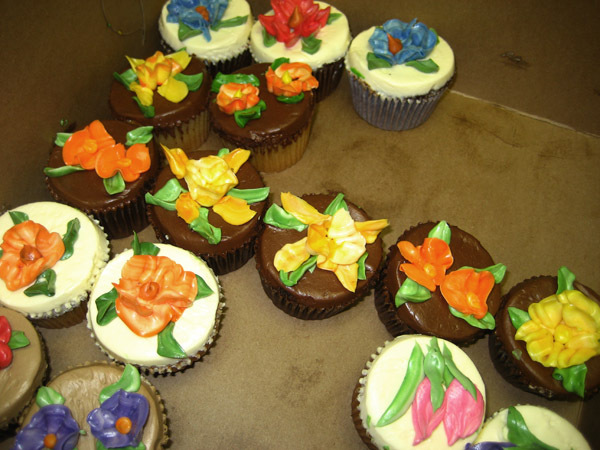 This entry was posted on February 4, 2008 at 4:45 pm and is filed under *Erin, Bakery, cupcakes, dessert, Obama. You can follow any responses to this entry through the RSS 2.0 feed. You can leave a response, or trackback from your own site.